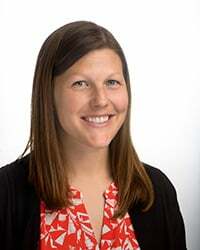 Kayla Collins, who is now an instructor in the Department of Occupational Therapy, first joined the university full time in 2013 as an adjunct instructor in the department and a clinical education development representative. She worked as a geriatric and pediatric occupational therapist from 2010 to 2015. She has presented her research at the Florida Occupational Therapy Association conference. She has a certificate in Caregiver Training from Thomas Jefferson University in Philadelphia, which allows her to provide support to families who are caring for individuals with dementia. She is a member of the American Occupational Therapy Association and National Board for Certification in Occupational Therapy and is currently pursuing her Doctorate of Education (EdD) at the university.